picture perfect: meg's bathroom AFTER! — Pencil & Paper Co.
picture perfect: meg's bathroom AFTER! Hi everybody, it's Meg again and I have news! Today is the day friends and I am BEYOND excited to share my bathroom reveal! As y'all know, I've been working on this little ranch for over 2 years and it gives me pure bliss to be nearing the finish line! This bathroom was one of the final major eye sores (except for the garage, and we'll save that for later!) left to tackle. Now that I've gotten over the horror of showing you my "before" bathroom yesterday (thanks to a hefty glass of wine! ), I'd love to walk y'all through a little tour of the renovated space! Can we talk about these gorgeous Kohler bathroom fixtures for a minute?! I knew I wanted to add warmth to the space and one of the best ways to do that is to bring in a little brass! It just gives the space that perfect touch of glamour – and I won't even lie, it makes me feel fancy and every lady deserves to feel a little fancy every once in awhile! I love the Purist line and especially this faucet which combines modern lines paired with traditional x-handles. For us, it's all about the mix! The bathroom is really small which means storage (I just might have a slight obsession with skincare) is a major necessity. I searched high and low for a medicine cabinet with brass finishes and it seemed like every option I found was either on major backorder or completely out of stock. I finally decided to move forward with the classic recessed cabinet from Pottery Barn and removed the knob and hinges myself and took them straight to the plater. You could always tackle this DIY yourself with spray paint or, I recently stumbled upon this product which looks amazing! I had to work within the existing footprint of the bathroom but to make the space feel "bigger" I added white subway tile which automatically makes the space brighter! If you saw our stories from yesterday, you may have noticed that awful eye sore also know as my bathroom vanity! I immediately set out to remove that bad boy and replace it with this beautiful classic pedestal sink from our friends at Kohler which visually opens up the space and shows more of those gorgeous floors! One of my favorite unexpected details of the bathroom is that little rattan monkey! There is a joke around the office that I have to STOP when it comes to animals in decor, but don't be afraid to add a little something that seems a bit off! Most times it's the little things that help make a space more visually interesting! As y'all know, design is in the details, and when it comes to shower niches, this couldn't be more true! To be honest, we're typically not fans mainly because it's hard to achieve a perfect clean edge detail. One trick we've found is to use marble for the surround, it helps give you clean lines and in my case, it worked out because it ties back to the marble floors! 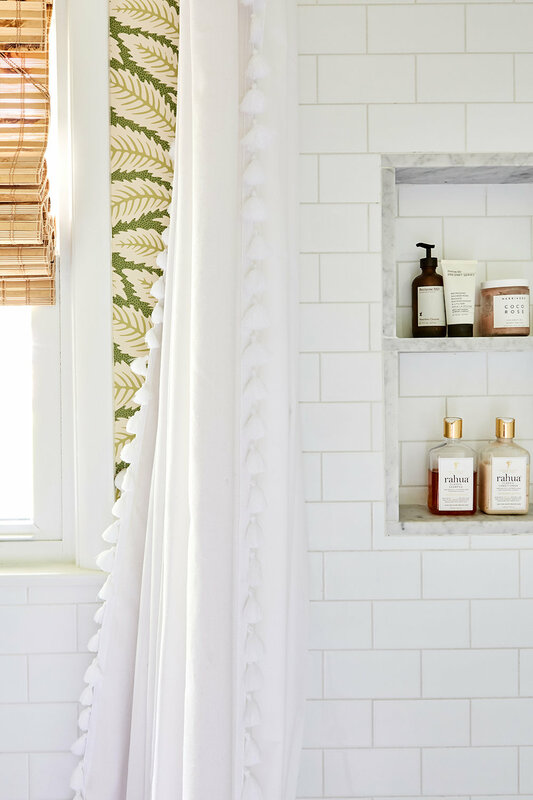 Another detail that I really love is the simple tassel on this classic white shower curtain from Serena & Lily. It's super subtle but makes me so happy! Keeping a consistent color palette throughout your house is key! It helps the space feel more cohesive and gives a good flow. My primary colors throughout the rest of my house are green and black which helped make my decisions for the bathroom much easier! One way to bring color into a space is through my favorite, wallpaper! 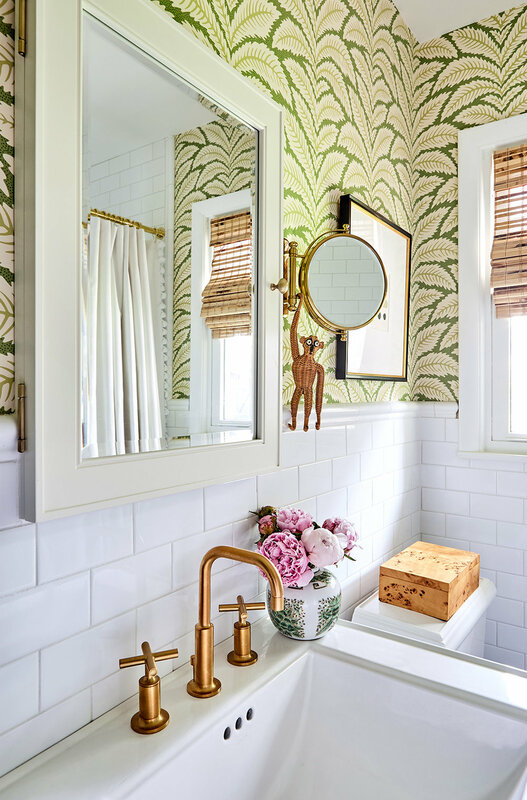 It's no surprise that we're HUGE fans of wallpaper at Pencil & Paper Co., it's so transformative and immediately gives visual interest to any space. (see all of our "wallpaper favorites" here!) Since I already have Schumacher's Deconstructed Stripe wallpaper in my entry, I knew I wanted something with a bit more whimsy for the bathroom. When I came across the Talavera wallpaper by Brunschwig & Fils, I immediately in love, especially seeing how perfectly it tied back to the Lotus Garden fabric by Schumacher I have in my main living space. 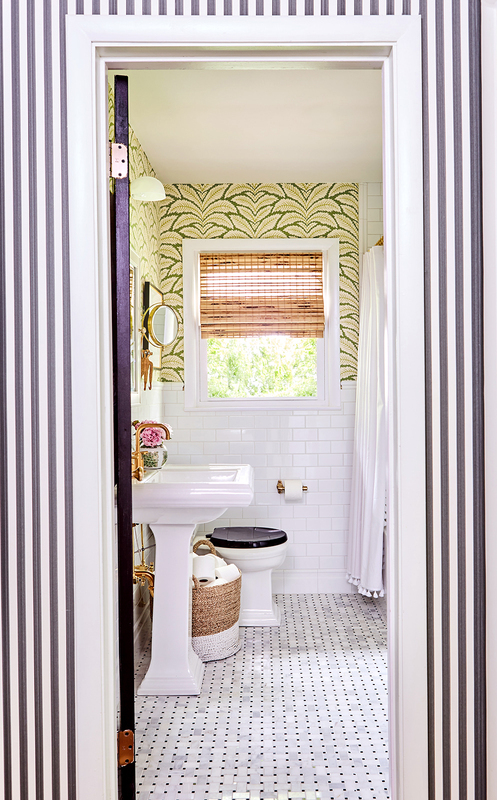 One of my favorite last minute decisions was the addition of the black Closet Stripe wallpaper by Farrow & Ball that I added to my tiny little hall leading into the bathroom. After all, mixing patterns is something we're known for! 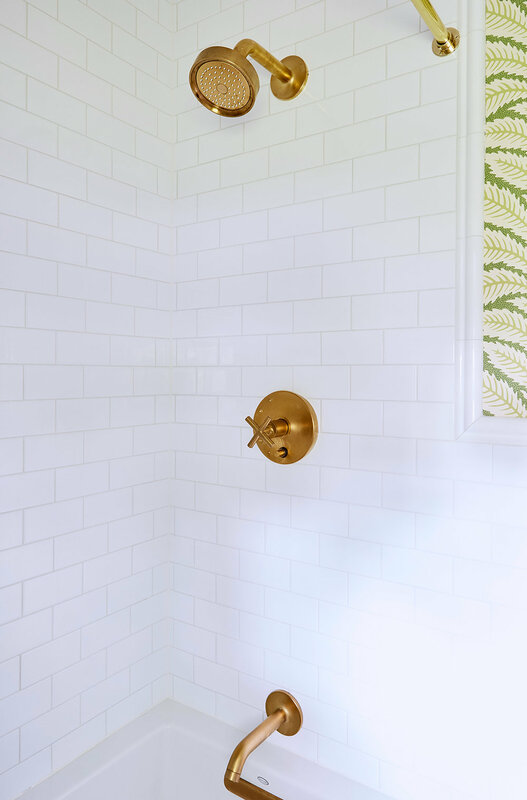 One decision I went back and forth on was the location of my shower trim! There are so many different standards when it comes to the location of your plumbing fixtures and honestly, there is really no right or wrong answer! For me, even though I absolutely love taking baths, I take showers 95% of the time which is why I ultimately decided to move the valve up to standing height. I'm so glad I did and also thankful I had a patient contractor (thanks Mike) who last minute had to change the location for me! I think oftentimes in design, items like toilets are often overlooked! We're big fans of a round front and the Kohler Memoirs Classic Two-Piece toilet has always been a "go-to" in our designs. One way to customize them is through the hardware, I decided to match back to my brass fixtures and love the black toilet seat which ties back to the black details throughout the space. Thank you for coming along on this little tour with me! I also have to give a HUGE thank you to Kohler who sponsored this post and provided all of the beautiful plumbing fixtures, the space wouldn't have been nearly as amazing without them! And, a massive thank you to our photographer, Austin Gros, who captured the space in the most gorgeous way! For more fabulous inspiration, visit ideas.kohler.com!